Vikas Chandra, more popular as Guddu Baba, is a veritable one-man army. He has taken upon himself the task to save the Ganges which flows by Patna, after leaving the job of a college lecturer to become a full-time campaigner. 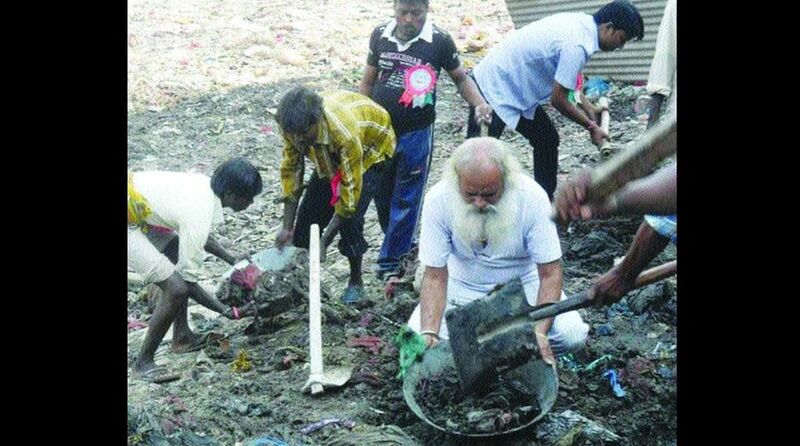 Vikas Chandra alias Guddu Baba (with flowing white beard) cleaning the bank of the Ganges in Patna. One man from Bihar has launched a crusade to save the Ganges, India’s most sacred river which nourishes over half a billion people who live on its banks. In over two decades since Vikas Chandra launched this campaign, the man with a flowing beard has earned wide applause for his dedication to save the river. Vikas Chandra, more popular as Guddu Baba, is a veritable one-man army. He has taken upon himself the task to save the Ganges which flows by Patna. Such has been his affinity for “Mother Ganga” that he left the job of a college lecturer for good and became a full-time campaigner. But that didn’t happen all off a sudden. “On a winter night in 1998, I was returning home after my daily ritual of meditation before the lighted pyre on the other bank of the Ganges. Hardly had I alighted from the boat, a stray dog on the river bank caught my dhoti by its mouth and kept dragging me in a particular direction. I found it quite unusual. Friends suggested I ignore the dog but I was curious,” he recounts. He left his colleagues and allowed the dog to lead him. “After some time, the dog stopped at a place just behind the postmortem house of the Patna Medical College and Hospital (PMCH) which touches the bank of the Ganges. What I saw there was appalling and heart-rending – piles of rotting, unclaimed corpses floating on the water and polluting the holy river. Soon, I took a vow to save the river,” he adds. Thus was born the mission to save the Ganges. On any day now, Guddu Baba can be seen leading a group of volunteers armed with spades and baskets and cleaning the river banks from waste or worship material thrown away by devout Hindus. “The Ganges has become a victim of faith,” he mourns in a freewheeling interview with The Statesman. But, he finds the drain water and industrial wastes more responsible than faith for polluting the sacred river. “The drain water’s contribution in polluting the Ganges is a huge 74 per cent whereas 24 per cent pollution has been caused by industrial waste. The devout contribute two per cent,” he explains. However, he rues the way the system runs. For every challenge to be overcome, he had to move the court. It was the result of his constant campaign that the Patna High Court directed the government to cremate the dead with dignity. The order was passed on 16 July 2001. “Now, no body is thrown into the Ganges by this hospital,” he says with confidence. Yet he was not satisfied. 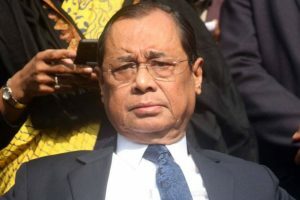 He wanted to get a similar order implemented in the entire country and so he filed a case in the Supreme Court in 2013. Acting on his complaint, the top court has now asked the Union home ministry to issue an order in this regard. “A guideline in this regard has already been made and according to my information has been sent to the Union cabinet for its approval,” he said. He also fought for putting a ban on dumping of animal carcasses in the river. His fight bore fruit in 2010 when the court ordered for the installation of incinerators for the disposal of carcasses. His constant fight to save the Ganges from pollution has also kept all three once-defunct water treatment plants running although they are unable to do so properly now. The Ganges may not still be clean but his sustained campaign has seen scores of people joining him. “I have done whatever I could have at my own level and without any financial support,” he says with a sense of satisfaction. Guddu Baba is a fighter to the core. He never took things lying down. Also, he did not care about the money involved in fighting court cases or fret about the slow pace of justice delivery in the country. “Nothing moves in the country without the intervention of the court. For every big thing to be done, I had to rush to the court, and I am thankful to the court that it took cognizance of my cases,” says Guddu Baba who hails from Goriakothi village in north Bihar’s Siwan district. At present, a total of 63 cases related to various issues of social interest filed by him at different points of time are pending in courts. Of them, 58 are pending in the Patna High Court whereas the rest are in the Supreme Court. Every week, he can be seen making the rounds of courts. One room of his two-bedroom rented house in Patna is filled with court papers. How does he manage to fight cases? “Benevolent people donate money to fight such cases. I have never had paucity of funds,” he claims. His transformation from lecturer Vikas Chandra to Guddu Baba – the nickname which he earned for fighting for the environment – took place when he landed in Patna in 1998 after the local district administration began harassing his family members when his brother got into a dispute with the then DM. Prior to reaching Patna, he had been teaching at the BBN College, Bagha in West Champaran having done his post graduation in political science and public administration.